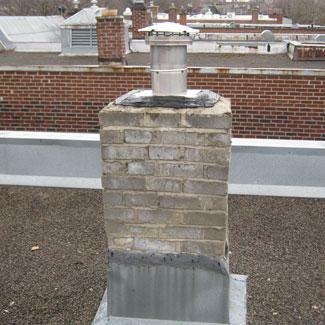 Was your chimney's yearly maintenance performed? 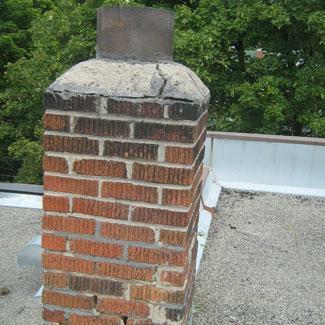 Does your chimney need repair or rebuilding? 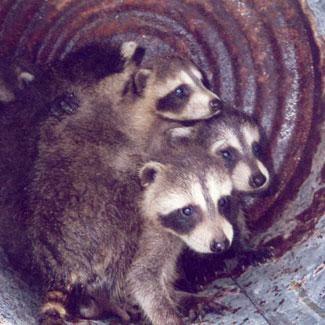 Is your chimney subject to animal invasions? Detect problems before they happen! 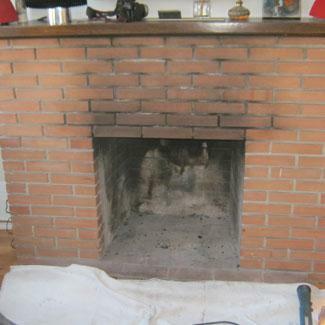 Were your chimney and appliance (fireplace, wood stove, oil furnace chimney) serviced many years ago? 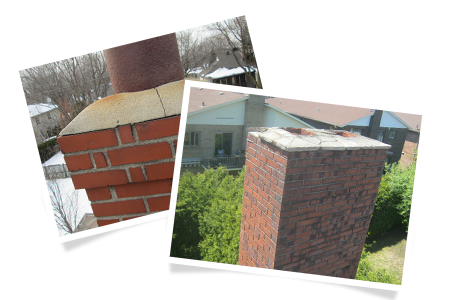 Are your chimney's mortar joints cracked or degraded? 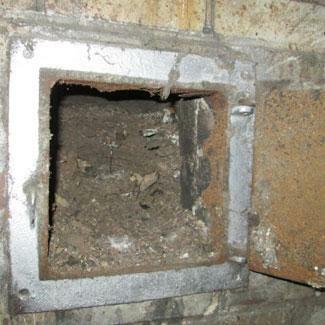 Is your chimney flue unprotected? 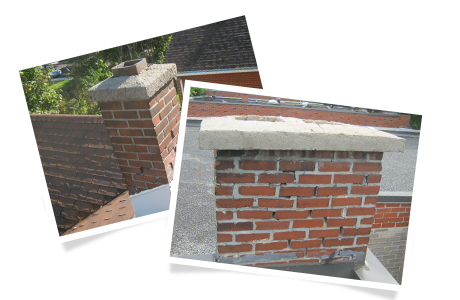 Is your chimney's cement crown inexistent, cracked or too small? 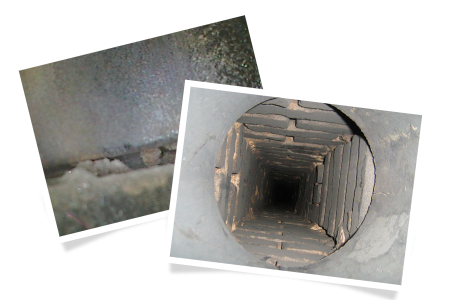 Are the mortar joints inside your chimney's flue degraded? Do you have smoke spillage problems in your house? Are you buying a house? 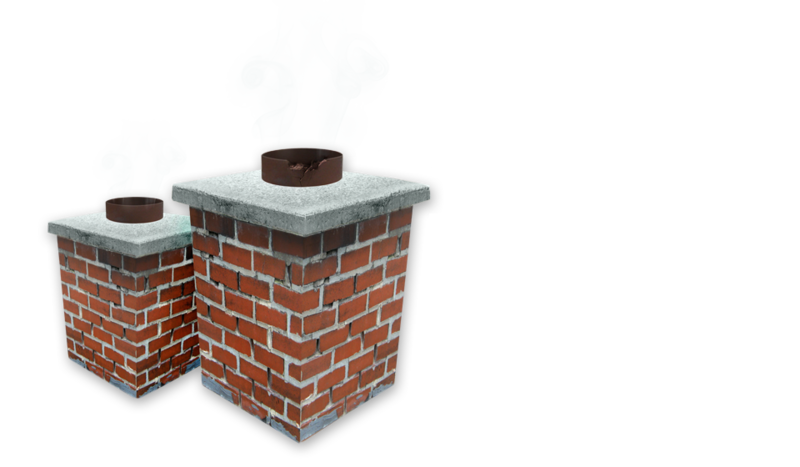 Did you ever have a chimney fire? Do the firebox and smoke chamber show signs of aging? Do you want to reduce heat losses and improve your security? 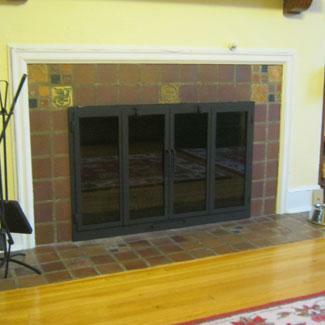 Do you want to give a new look to your masonry fireplace and make it more efficient? 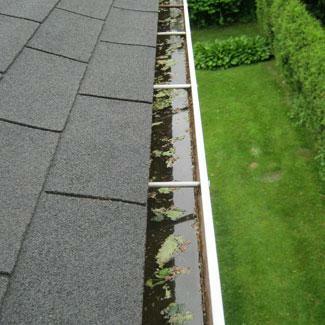 Do you need to empty your gutters regularly to keep them from clogging? Since 1980, Mr. Jean Laviolette and his team (formerly "The Happy Sweeper (Centre)") have been striving to provide you with a unique service. Every year, Mr. Laviolette attends the "National Chimney Sweep Guild" (NCSG) conventions, as a member, to keep up to date on the innovations in fireplaces and chimneys maintenance, repair and restoration. With their high quality work, professionalism, continuing education (in Quebec, Canada, and the United-States) and important involvement with the APC (Association des professionnels du chauffage), "Healthy Chimney" stands out in the industry. 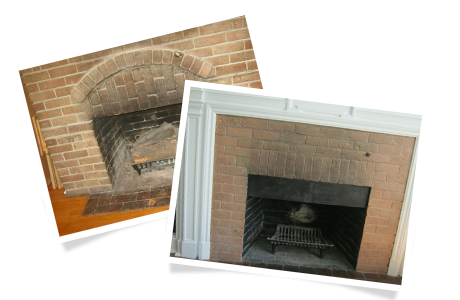 Always looking to offer the best maintenance and repair service, "Healthy Chimney" specializes in the restoration of fireplaces and chimneys. Several new technologies are now available to give a fresh start to your aging facilities and make them safer. 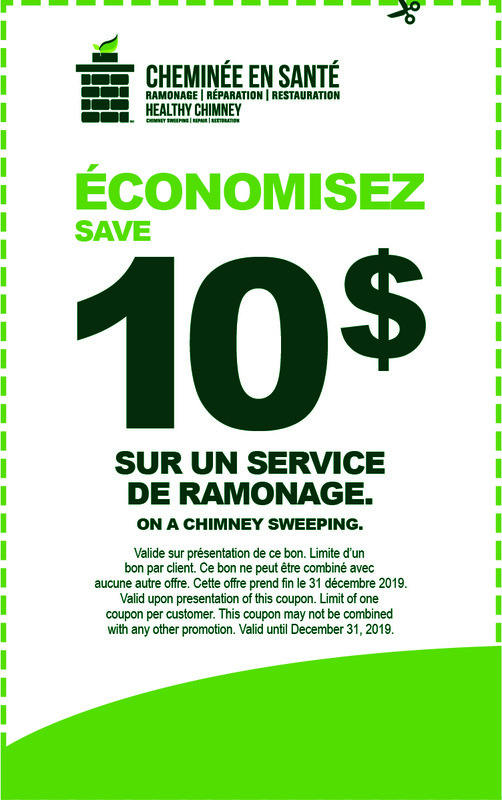 To ensure consumers safety, the APC (Association des professionnels du chauffage) recommends the complete sweeping of their combustion devices' evacuation system, whether it is a fireplace, a wood stove or their heating system's chimney. 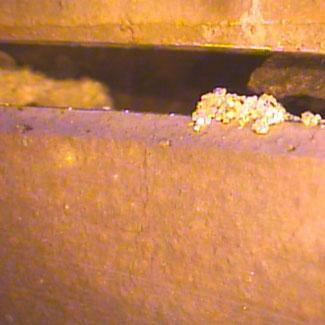 During sweeping, we perform a summary assessment of the system to be cleaned. The chimney is given a good scrub with an appropriately sized brush. 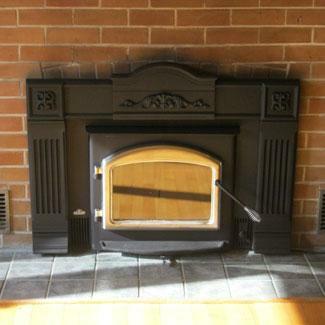 The hearth, the firebox, the smoke chamber and the draft regulator, or the wood stove and its chimney connectors are thoroughly cleaned. 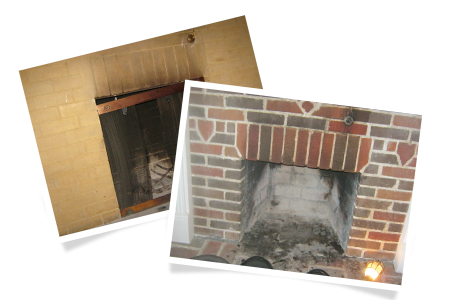 We remove the debris at the base of chimney, in the fireplace and the wood stove. 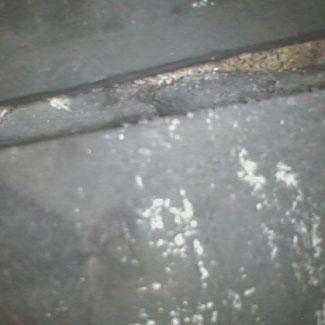 3- glazed (vitrified), like thick black paint. 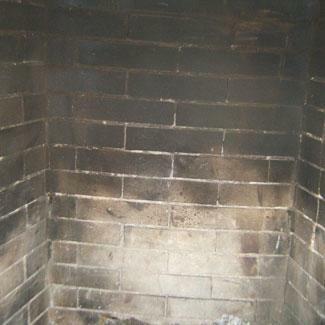 Creosote buildup is one of the main causes of chimney fires, and constitutes a real hazard. A highly efficient wood-burning appliance, a proper setup and appropriate operating techniques will significantly reduce the risks of chimney fire. To reduce the accumulation of creosote, you can use the "Anti-Creo-Soot (ACS)" product. It is a non-toxic and environmentally safe catalyst that attacks and destroys creosote and soot. 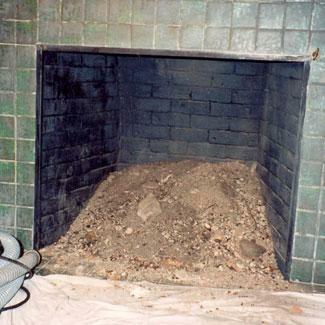 When sprayed daily into the fireplace or stove during a low intensity fire, ACS helps convert creosote and soot into a harmless ash or char that can be easily removed. This type of assessment of the accessible parts of your appliance and its chimney will give you an overall sense of its condition, and of the options and repair solutions, where applicable. 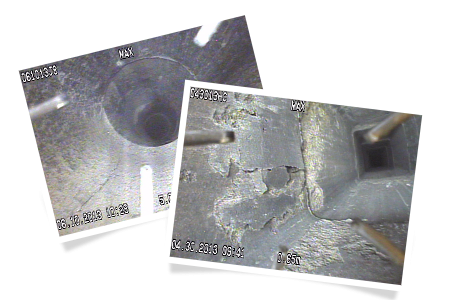 When a more thorough assessment of the chimney flues is required, using a video camera is essential. 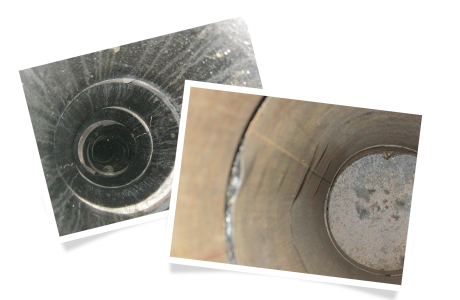 This assessment will help us verify the state of the flues over their whole length and detect any anomalies. We will deliver you a report with pictures and recommendations. 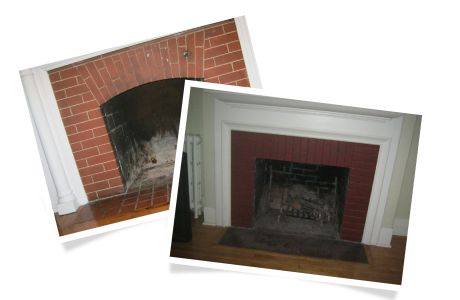 This type of assessment is very helpful when you buy a house or after a chimney fire. 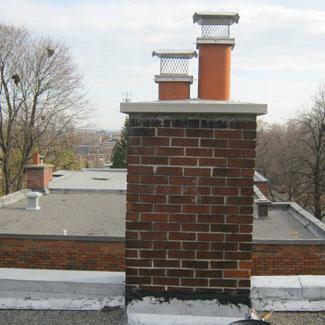 Masonry chimneys require periodic maintenance to repair cracks in the crown area and deteriorated mortar joints, especially in the section above the roof. 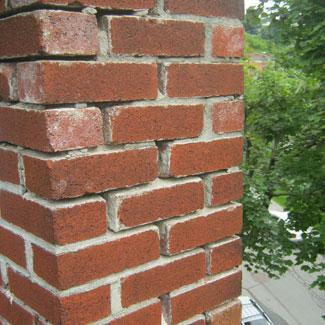 We can handle brick repair works, from simple tuck-pointing to chimney reconstruction, from the rooftop. Our reconstruction work complies with the standards of the National Building Code of Canada. 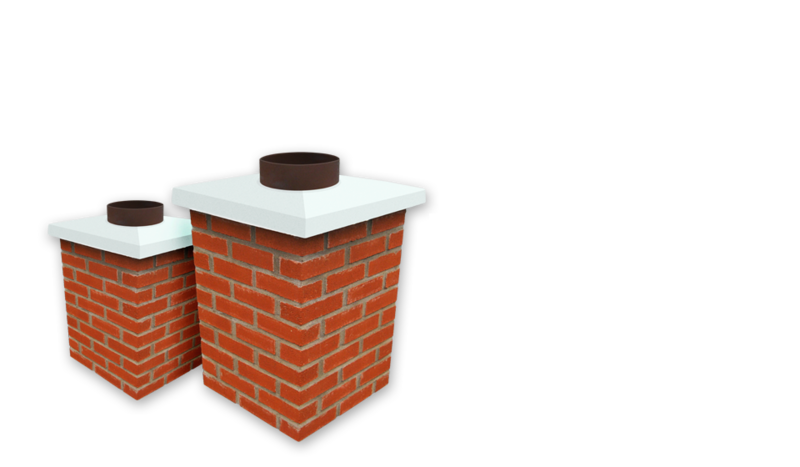 Moreover, the chimney must have a concrete crown with a dripstone, to prevent water from running down the sides of the chimney and degrading the mortar joints and bricks by erosion, and a weatherproof expansion joint for keeping water out of the brick structure. 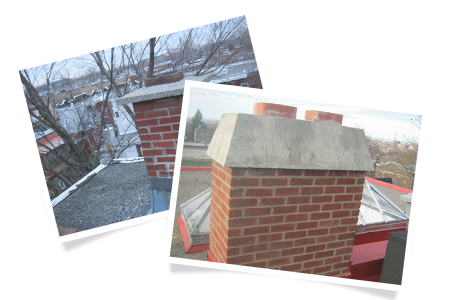 These details will help preserve your masonry chimney for many decades. 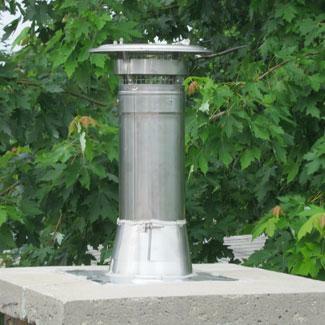 Caps with wire mesh (spark arrestor) are essential to eliminate animal intrusions, and the accumulation of leafs, branches and other debris that could clog the flue. We only install stainless steel or copper caps, with a lifetime guarantee by the manufacturer. These caps are fastened tightly to the flues to prevent them being swept away by the wind. 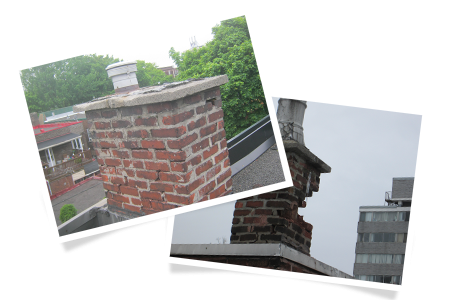 When the concrete crown does not exceed the chimney walls or has no dripstone, contrary to the National Building Code of Canada standards, water runs down the sides of the chimney, degrading the mortar joints and bricks by erosion. 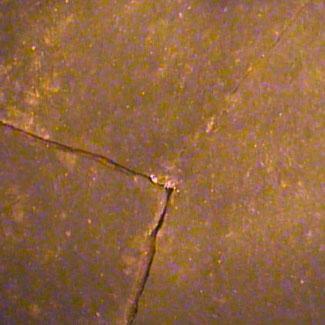 When the crown is cracked, water can infiltrate the brick structure. To address this problem, we can install a metallic crown cover with gutters. 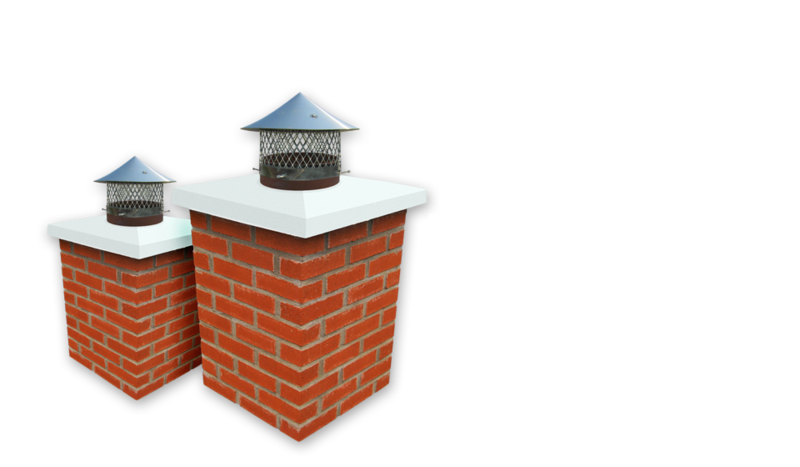 The installation of a liner into an existing masonry chimney or a prefabricated chimney can be necessary for several reasons: to repair a chimney with a cracked or broken flue, to reduce the inside diameter, to subside combustion gases heat loss, to reline a chimney with no flue tiles (ceramic tiles), or to install a recessed appliance. We specialize in the installation of stainless steel liners. 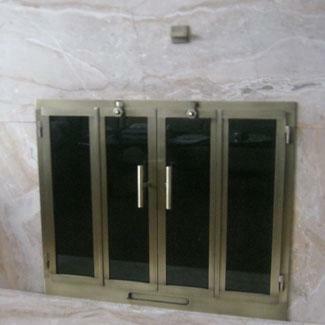 The careful selection of materials, and our installation techniques, will ensure higher quality results. Different solutions are available, such as the installation of a fireplace door or a mechanical fan, providing continued ventilation to eliminate air returns and unpleasant odours. We can install a stainless steel liner and smoke chamber or, if possible, apply a long-lasting ceramic sealant to seal cracks and stop the mortar joints degradation. After many years of use, the firebox and smoke chamber show signs of aging. Restoration must be considered. The firebox is rebuilt and the smoke chamber is sprayed with a ceramic coating to seal holes and spaces, and to form a layer impervious to acidic elements, fumes and water. To optimize security and your fireplace's efficiency, while reducing heat losses, we propose a vast variety of fireplace door models. Many types of plating and accessories, such as registry keys, log carriers and tools are available. An EPA (American environment protection agency) technology wood stove has clean combustion properties and provides large amounts of heat. This reliable appliance is a valuable addition to your house that helps you to save on electricity bills. Some models propose different decorative accessories to personalize your stove and make sure it matches your decor. 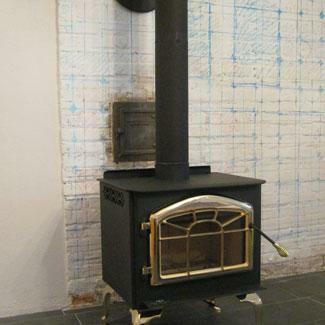 The installation of an insert appliance in your existing masonry stove is an economical, durable, and green solution. Whether it is a wood, gas or pellets appliance, our models respect the EPA (American environment protection agency) standards. 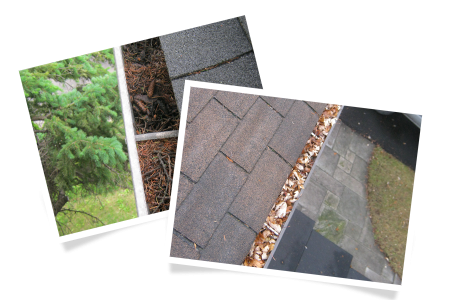 Gutter protectors keep debris from clogging your gutters and prevent damages caused by snow and ice. Laval, and the North Shore. 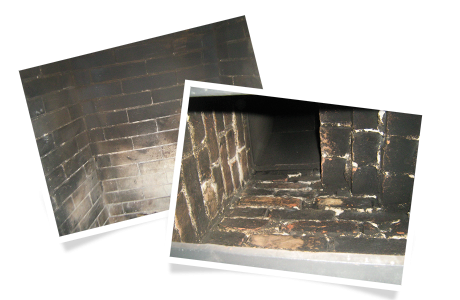 To know the condition of your chimney and your appliances, an inspection and an annual sweep are essential. Healthy Chimney is a leader of industry for their professionalism and their workers' skills. 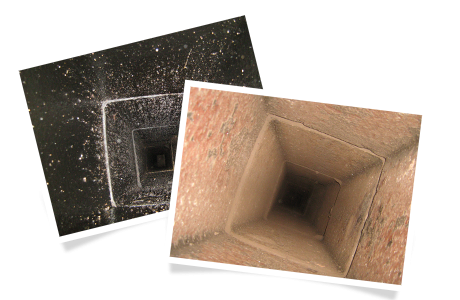 Healthy Chimney is affiliated with Les Entreprises NCS to clean dryers and ventilation ducts. 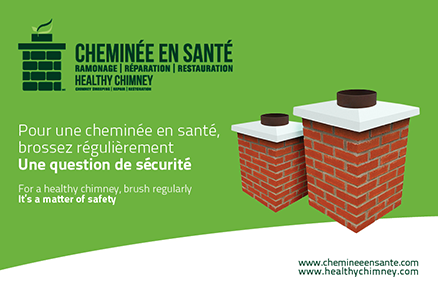 call the 514‑336‑6080, write us at info@healthychimney.com or fill-in this short form.